In 1940, the Brewers hired former White Sox catcher Ray Schalk to manage the club. Schalk had come up through the Brewers, playing on the pennant-winning 1913 and 1914 clubs. 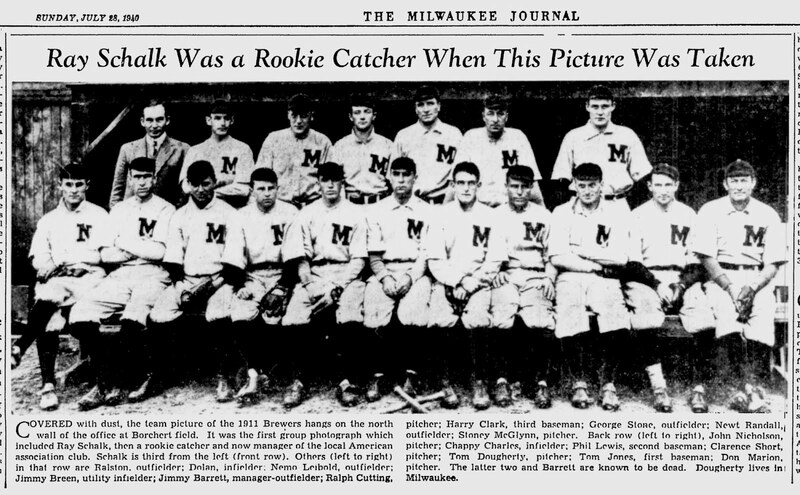 To celebrate the hire, the Milwaukee Journal ran this photo of the 1911 Brewer squad, Schalk's first in a Brewer uniform. Covered with dust, the team picture of the 1911 Brewers hangs on the north wall of the office at Borchert field. It was the first group photograph which included Ray Schalk, then a rookie catcher and now manager of the local American association club. Schalk is third from the left (front row). Others (left to right) in that row are Ralston, outfielder; Dolan, infielder; Nemo Liebold, outfielder; Jimmy Breen, utility infielder; Jimmy Barrett, manager-outfielder; Ralph Cutting, pitcher, Harry Clark, third baseman; George Stone, outfielder; Newt Randall, outfielder; Stoney McGlynn, pitcher. Back row (left to right). John Nicholson, pitcher; Chappy Charles, infielder; Phil Lewis, second baseman; Clarence Short, pitcher; Tom Dougherty, pitcher; Tom Jones, first baseman; Don Marion, pitcher. The latter two and Barrett are known to be dead. Dougherty lives in Milwaukee. Schalk first came to the Brewers in 1911 from Taylorville in the Illinois-Missouri League. His contract, purchased for $100, was sold one year later to the Chicago White Sox for $10,000. He spent the next sixteen years at Comiskey Park, all behind the plate and the last two as player/manager. After hanging up his mask, Schalk continued his managerial career in the minors. He put in six years in charge of the International League's Buffalo Bisons and two with the American Association's own Indianapolis Indians before being hired to guide the Brews through the last months of the season following the resignation of Mickey Heath on July 27th. Schalk was elected to the Hall of Fame in Cooperstown by the Veterans Committee in 1955. Today, he's perhaps best remembered for his connection to the 1919 Black Sox scandal, one of several former Brewers caught up in the scandal.